The World Health Organization has estimated that the number of blind people in the world could double in the next 25 years. To combat the leading causes of blindness and assist in preserving vision, Alton Lions Club participated in the Lions World Sight Weekend on Saturday 16 October. This year British Isles and Ireland Lions Clubs wanted to build on the success of last years World Sight Day when 70 Clubs took part by increasing the number to over 100. This year Alton Lions took a party from the Alton Branch of Open Sight on a walk around Alton guided by David Hall from the Alton Town Walks Organisation. The intention was to provide an enjoyable event and to understand more about the problems encountered in completing a walk of this nature. The morning started at the Assembly Rooms where Alton Town Mayor David Willoughby and his wife Margaret joined for coffee and special cake from Tizzie’s. Suitably fortified the group started their journey from ‘The Cairn’ and completed it an hour and a half later after enjoying an educative and sunny tour around the town. 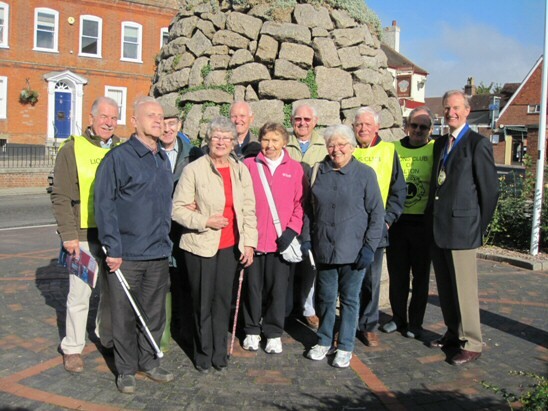 Pictured are the group as it started out from ‘The Cairn’ including from Open Sight Kate Ellis, Renata Ross, Bruce and Irene Slorance, James Gunner and Jim Brandon local Open Sight Chairman Graham de Neiderhausen, Lions Gordon Adams, Derek Shaw and David Warner and Town Mayor David Willoughby.